Calafuria, Livorno, Italy. Detail of apical parts of a cystocarpic thallus growing in mid littoral turf. 07 Feb 1998. Fabio Rindi. © Fabio Rindi (f.rindi@univpm.it). English: Banded Siphon Weed (Bunker et al. 2010). Lectotype locality: Baie de Laninon, Brest, France (Maggs & Hommersand 1993: 317). Lectotype: Crouan; PC ‘Algues Marines du Finistere’, no. 305 (Maggs & Hommersand 1993: 317). Guiry, M.D. (2012). A catalogue of Irish seaweeds. pp. -250, 1 pl. Ruggell: A.R.G. Gantner Verlag K.G. Rojas-Gonzalez, B., Afonso-Carrillo, J. & Ibeas, C. (1994). 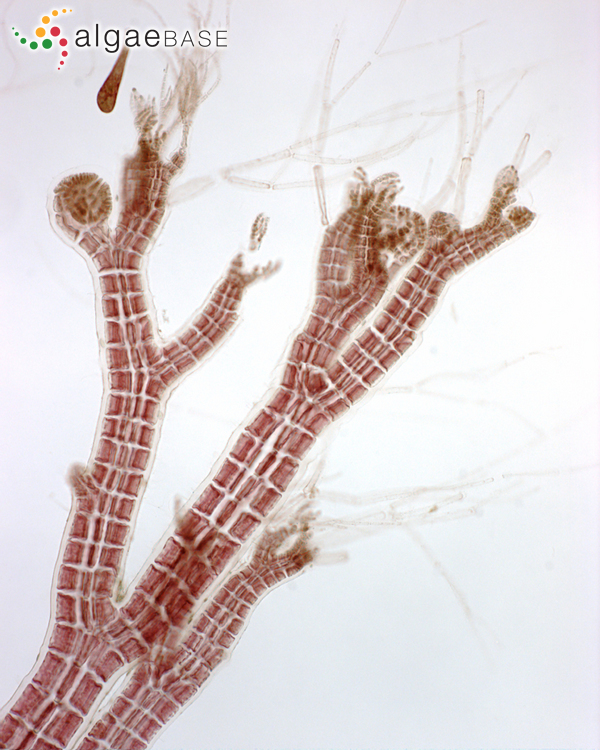 New records of Rhodomelaceae (Rhodophyta) from the Canary Islands. Botanica Marina 37: 133-138. Accesses: This record has been accessed by users 4759 times since it was created.